There are many monasteries in Serbia and the most beautiful ones and of great importance for European and world medieval architecture and art, are mainly concentrated in the valleys of rivers Ibar and Raška (Rashka). The oldest were built in the 12th century. Erstwhile, the medieval Serb state stretched through this, so called "Valley of the Kings", south of town of Kraljevo, below Novi Pazar. At the request of the King Uroš I Nemanjić, liliacs where planted along the valley as a special welcome for his future bride, Helen of Anjou, the french princess. Here is, also were the tradition of endowement in Serbia begins. The biggest and most beautiful temples were built by the mighty Serbian Kings, but endowers were also landlords, monks and the common people. Some of these temples with their treasures, paintings, frescoes, icons... are on the UNESCO list of World Heritage. This region has been declared by Council of Europe for "The main European cultural Route". Mountains are rising up on the both side of the river Ibar. On one side rises "The roof of Serbia", national park and famous ski center of Kopaonik Mountain. On the other side mountain Golija, declared of UNESCO as the reservoir of the biosphere. Entrance of the valley is guarded by the medieval fortress of Maglič. Most of these monasteries can be reached along the southern section of the Ibarska Magistrala that stretches from Kraljevo through Raška down to Novi Pazar. 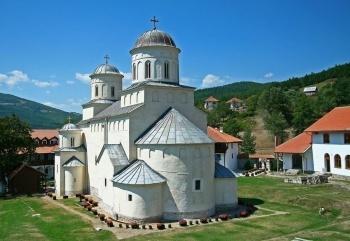 The Žiča monastery is located only a few kilometers from the center of the city of Kraljevo. It was built in the heart of the medieval Serb state, shortly after establishing the Orthodox Serbian Church's independence, by Sent Sava and his brother Stefan Prvovenčani, sons of Stefan Nemanja. Symbolically, it was built at an equal distance from Rome and Constantinople, stressing the tendencies of the medieval Serb state to balance between these two. In 1219 it becomes the first Archbishopric of Serbian Orthodox Church, with Sava as the first archbishop. Two years later, in 1221, King Stefan Prvovenčani was crowned there. It was vandalized under the onslaught of Bulgarians and Tatars, restored by King Milutin, but destroyed again many times. Little is known about this monastery during the Ottoman Empire. It was only in 1855 that it was restored again, and King Milan Obrenović was crowned here. According to a legend, for each coronation, one door was made for the King to enter, and immured once the coronation is ended. That is why this monastery is also called "Sedmovrati Hram", ("The Seven-doors Temple"). Studenica Monastery is situated 11km from village Ušće, on the regional road Kraljevo - Raška, by the river Studenica. It was built in the 12th century, endowment of the king Stefan Nemanja between years 1183 and 1196, and was dedicated to Virgin Mary. The same year King Stefan Nemanja gives the throne to his mid-son Stefan Prvovenčani and become a monk in Sveta Gora (on Mount Atos in Greece), where he dies in 1199. 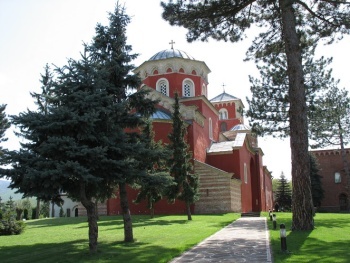 His youngest son Rastko, better known as Saint Sava, also a monk, transfers his remains to this monastery. His wife Anna and their two sons Vukan and Stefan Prvovenčani, are also buried here. The architecture of the Studenica Monastery, its murals and frescos, are a mixture of the old Raška school, Byzantine and western styles. 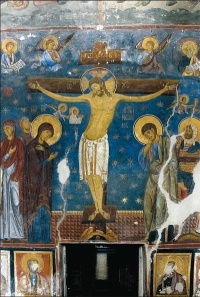 The fresco "The Crucifixion of Jesus Christ" is one of the most significant and most beautiful examples of medieval art in Europe. In this monastery Sveti Sava founded the first hospital in Serbia, modelled on Byzantine monastery hospitals. Studenica was robbed, burned, vandalized and restored many times. Today, this monastery is on the list of UNESCO World Heritage. The Sopoćani monastery is situated in the valley of the river Raška, near the ruins of the old capital of the medieval Serb state - Ras, 15 km west from the town of Novi Pazar. 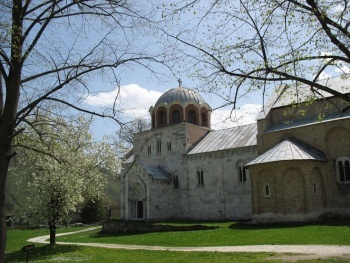 An endowment of King Uroš, the son of King Stefan Nemanja, it has been built in the 13th century, and dedicated to Holy Trinity. Built in Romanesque style, with an interior decorated by artists from Constantinople, which was the center of European culture and art of that time, it is one of the most significant and beautiful monuments of the medieval culture. Its frescoes brought the world fame to this monastery. Shortly after it was build, King Uroš was dethroned. He retreats in the monastery and becames a monk. Here is where his and the remains of his mother Ana, rest. 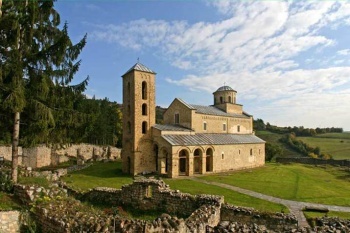 In 1979, this monastery was declared Monument of Culture of Exceptional Importance, and protected by Republic of Serbia. It is also in the UNESCO's list of World Heritage. 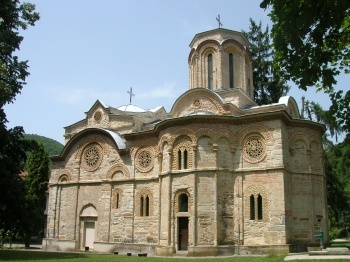 The Djurdjevi Stupovi monastery is located on the top of the forested hill, above the town of Novi Pazar. This monastery was built in 1170, an endowment of King Stefan Nemanja, shortly after his victory in the war with the Byzantines. It was dedicated to Sent George and also named by this saint and its two, impressionable bell towers. This complex was built in a mixture of Romanesque and Byzantine styles, so called Raška school style. The interior walls are painted with frescoes that portray historical scenes and the portraits of first rulers of the Nemanjić dynasty. This monastery is on the UNESCO list of World Heritage since 1979, and on the pan-European Romanesque culture Route. Ravanica monastery is located in the base of Kučaj Mountains, near the town of Ćuprija and village Senje, in the Pomoravlje region (valley of Morava river). It was built in the 14th century, between 1375 and 1377. Endowment of prince (knez) Lazar Hrebeljanović, it is dedicated to Ascension of Jesus Christ. This monastery is an example of the "Moravska school" (Moravian school), art and architecture style that becomes typical for this region. It is surrounded by a massive wall with seven towers. Ravanica was robbed and burned many times by Turks and it is poorly preserved. The frescoes are mostly with battle scenes from the war with Turks, price Lazar, his wife Milica and their sons Stefan and Vuk; The Wonders of Christ and Christ's suffering. Manasija monastery, also called Resava, is located in the Pomoravlje region, 2 km from the town of Despotovac, 30 km from the Belgrade - Nis highway, by the river Resava. It was built in the 15th century, between 1406 and 1418, by Despot Stefan Lazarević, also known as Visoki Stefan (Tall Stefan), and it is dedicated to the Holy Trinity. Manasija monastery is a typical example of Moravska school architecture style, surrounded by massive walls, with 11 towers, among them, as the largest one, stands up the tower of Despot. It was vandalized on many occasions, by Turks and stayed roofless for more than a century, so one third of fresceos, icons and paintings were destroyed irretrievably. Those that remained are outstanding achievements of medieval painting. 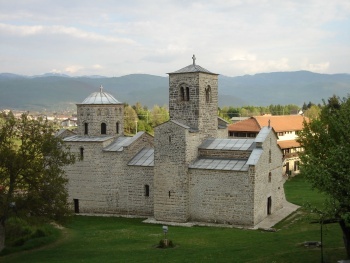 Manasija monastery complex consists of: the church of the Holy Trinity, a spacious dining room - refectory, also called the school and, the massive walls and towers. The refectory was the place where the famous "Resavska school" was founded. Here, the transcription and translation of many significant church books, took place and, this stands as a beginning of Serbian literacy. The most of the library was burned and the monastery is poorly preserved. The reconstruction and restoration is still in progress. 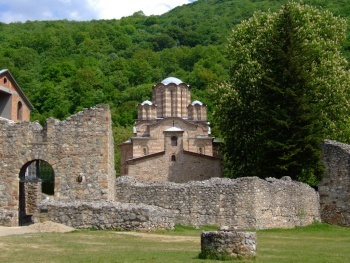 Manasija monastery was declared Monument of Culture of Exceptional Importance in 1979 and, protected by Republic of Serbia. It is also on the UNESCO's Tentative list. Ljubostinja monastery is located 5 km from the town of Trstenik, 17 km from Vrnjačka Banja spa, in the mountain valley of river Ljubostinja. It was an endowment of Princes Milica, the wife of famous Price Knez Lazar Hrebeljanović and, dedicated to the Assumption of the Holy Virgin. The building of this temple started in 1388, just a year before the famous Battle of Kosovo where Prince Lazar died and, lasted till 1405. It is built in style of "Moravska school", the Serbian Medieval architecture style, with a rich exterior. It is considered the most beautiful example of this style. Frescoes of the Ljubostinja monastery were painted after the Battle of Kosovo, between 1392 and 1403. The monastery was burned by Turks several times, so most of the frescoes were destroyed, and only some of them are preserved. Many of the paintings presented the portraits of Prince Lazar and Princess Milica, Despot Stefan and his brother Vuk. Among those with a religious motif, the most significant are: "Great Holidays", "Sufferings" and "Christ's Miracles ", which are still preserved. After the great Battle of Kosovo, Princess Milica left the throne and become a nun. Many widows of nobleman that lost their lives in the Battle of Kosovo and the Battle on river Maritsa, have become nuns and retrieved here. Princess Milica was buried here, alone with the famous nun Jefimija, the first Serbian poetess, who wrote "Eulogy for Prince Lazar", that is, beside prayer - poem, also a significant historical source describing events around the Battle of Kosovo and the period after. She embroidered in gold the text of this poem on the Shroud of Prince Lazar, now kept in the Museum of Orthodox Church in Belgrade. On one occasion, when Turks set the fire on this monastery, the treasure hidden by Princes Milica, was found behind some of the icons. Among it was the Crown of Prince Lazar, which is now in Istanbul. Mileševa monastery is located in south-west Serbia, on river Mileševka, 6 km from the town of Prijepolje, in the gorge of the river Lim. This monastery was built as an endowment and the grave of King Stefan Vladislav Nemanjić, in the first half of 13th century, between 1234 and 1243. Monastery has been burned and robbed by Turks many times. King Vladislav transferred relics of his uncle, Saint Sava, from Trnovo in Bulgaria, to Milesheva, but in 16th century Turks took and burned the remains of this Serbian Saint on Vračar, in Belgrade. Mileševa was built in Raška school style, the finest balance between Byzantine and Roman architecture. It leans toward a classic antique, monumental without decorative elements and was modeled after the Žiča monastery. The western dome and Bell tower were built much later, in the 19th century. Frescoes of great significance for medieval art and, of exceptional beauty, brought Mileševa world fame. The best known is "Beli Andjeo", the "White Angel", representing the Archangel Gabriel, sitting on the stone, pointing with his left hand towards the empty grave of Christ. In the 16th century, another fresco was painted over, so it was covered until restoration in 20th century, when it was revealed again. Beside "White Angel" in the composition of the painting "Myrrh-bearing at Christ's Tomb ", there are also outstanding images of the Holy Virgin in the composition of the painting "Annunciation Day" and portrait of King Vladislav. These frescoes are the greatest achievement in painting in medieval Europe. Mileševa monastery is now a Monument of Culture of Exceptional Importance, and its frescoes with the "White Angel" as the most beautiful, are on the UNESCO World Heritage List. Located 17km from Loznica, in Korenita village, close to Tršić, the village where the most famous Serbian educator, author of the modern Serbian alphabet, Vuk Karadžić was born. The monastery was probably built by Queen Katalitna, wife of King Dragutin Nemanjić, between 1276 and 1282. It was vandalized by Turks in the 15th century and its church, dedicated to the Presentation of the Holy Virgin, was razed to the ground. This Monastery is located 8 km north from Raška town, on the right bank of river Ibar, in village Pavlica. It was built on high rock, above the railway track that runs through the gorge of the river Ibar, probably in the 12th century, in the style of Raška School and, dedicated to St. Peter. The founder is unknown. This church is situated near the town of Novi Pazar. Built in the 9th century, in Byzantine times, this is the oldest monument of church architecture in Serbia that dates from pre roman times. The frescos were painted later, in 10th, 11th and 12th centuries. It resembles the churches in Georgia and Armenia from 7th to 9th century but, the modifications that followed made it unique. It is on UNESCO World Heritage List, as a part of protected entity "Stari Ras". The Maglič Fortress is situated at the entrance to valley of river Ibar, 15 km southwest of the town of Kraljevo in central Serbia. 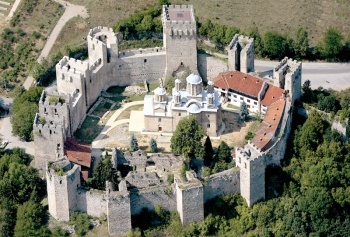 This is an important example of medieval Serbian fortification, with seven towers. The role of the Maglič fortress was to guard the entrance to the Valley of river Ibar, but it is unknown when it was built, probably at the time of the Byzantine Empire. It has been reconstructed and restored in the 13th century by Stefan Prvovenčani or his son King Uroš.